To produce a utilitarian horse that displays a functional well-proportioned conformation combined with the typical characteristics of the breed, health and vitality, and an aptitude for achievement in equestrian sports. 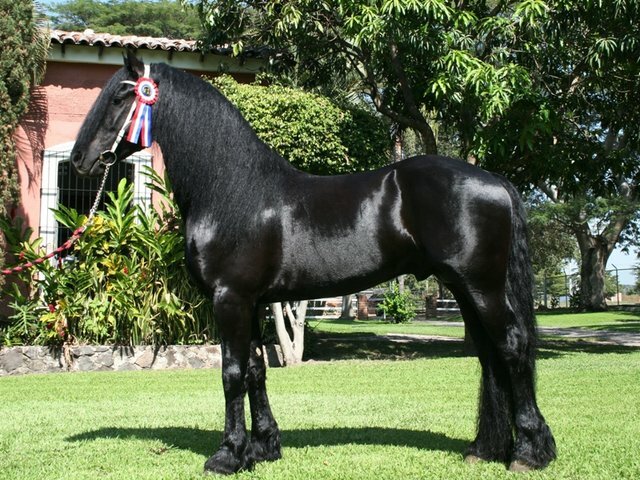 A horse with a elegant appearance and a proud bearing due to its typical front; thick mane, tail and fetlock hair; black color; and extended lofty (knee action) gaits. Head - A small, expressive, noble head in which the eyes are set far apart. The nasal bone is preferably somewhat dished. Widely spaced nostrils. The jaws are light and the mouth opening is long. The eyes are large and bright. The small alert ears have tips pointing slightly toward one another. Neck - Together, the long neck and poll form a slightly arched contour. The neck is very erect. Hair - The mane, tail and lower legs (fetlocks) of the Friesian horse display thick hair. Color - The hair color is jet black. White markings on the head are permitted on the condition that they are no larger in diameter than 3.2 cm and not localized below the level of the eyes. A horse with a harmonious, functional, proportionally correct, rising build; long forelegs; and a body that is not overly massive. The general shape is rectangular in which the proportions for the forehand, midsection and hindquarters are 1:1:1.
a. Poll - The poll is long (hands width) with a flowing transition to the neck. b. The throatlatch - The throatlatch displays an open lower contour with space for the throat. Neck - The neck is long, and the proper development of the upper muscles results in a slight arch. The neck emerges high on the chest and shows a flowing transition with the withers. Shoulder - The shoulder is long and sloping (at an angle of 45 to 50 degrees to a horizontal line). The angle at the shoulder joint is at least 90 degrees. Ribs - The ribs are long and bowed. Withers - The high point of the withers flows gradually into the contour of the back. Back - The back is strong and well muscled (neither humpbacked nor swaybacked). The contour of the back flows gradually into the shoulder and loins. The length of the back is in proportion to the length of the forehand and hindquarters. Loins - The loins are strong (neither raised nor sunken), broad and well muscled, with a flowing transition to the croup. Croup - The croup is long (as measured between the vertical lines of the hip and the hipbones), slightly sloping and muscled. Gluteals - The gluteals are long and well developed. The forelegs as seen from the front are perpendicular to the ground with one hoof width of space between them. Seen from the side, the foreleg is perpendicular to the ground down to and including the fetlock. The forearm and cannon are long. As seen from the side, the fetlocks are oval and dry. The hind legs as seen from behind are parallel with one another. As seen from the side, the angle at the hock is between 145 and 150 degrees. The gaskin is well muscled. The hock is dry, hard and well developed (broad and deep). The fetlocks as seen from the side are oval and dry. The pasterns are long and feathered. The angle of the front of the pastern with the ground should be 45 to 50 degrees. The angle of the back of the pastern with the ground should be 50 to 55 degrees. The hooves should be large, properly shaped, undamaged and of the right proportions for the horse. The hooves are wider in the front than at the back. The walk is a long-reaching and distinctively 4-beat. As seen from the front and back, the legs are parallel with each other. The hind leg displays flexion at the hock and is placed powerfully and far enough beneath the horse’s body. The hind leg propels the foreleg which is extended and displays plenty of flexibility at the shoulder. The trot is a distinctively 2-beat gait. The hind leg is placed powerfully and far enough beneath the horse’s body and displays a great deal of flexion at the hock. The foreleg displays knee action and is extended far to the front. The trot is characterized by suppleness and a long moment of suspension. The horse also displays a high level of balance and a rise of the forehand accompanied with a lifting of the neck. When viewed from the back or the front, the legs must be parallel with one another. The canter is a distinctively 3-beat gait. The canter is extended with long-reaching forelegs with the inside leg providing impulsion. The canter displays buoyancy, a long moment of suspension, and a high degree of suppleness and balance. The objective is to improve all the components involved in an aptitude for sports on the condition that the gentle character of the Friesian horse is retained, thus making the Friesian horse ideal for recreational use. In regard to usage, the Friesian horse is a versatile breed. This does not mean, however, that an aptitude for all the disciplines need be present to the same degree among each of these horses. The breeding objectives provide scope for specialization without this resulting in a breeding program aimed at developing specific types of Friesian horses for certain uses. The breeding objective descriptions for exterior and gaits are universal for all the usage disciplines.